Title: The gardener's self-portrait in tomato. Why do I have this ridiculously giddy grin on my tomato-y face? The answer is self-evident: Because this Ruby Gold is ripe at last. Despite cold. Despite rain. Despite blight. It's been two years since I tasted a Ruby Gold, which is my favorite of all heirlooms. Ruby Gold looks like sunset on a plate, and she has a tender juicy-juicy-juicy flesh and a sweetness beyond belief. Last year, hail battered her to the ground. This year, I've been watching this gnarled beauty fight her way into being. We ate her last night. Sliced. Simple. Sweet and delicious. As they ripen (if they ripen), we'll be featuring our heirlooms here. I'm a Fedco seed devotee, and though I adore the catalog's bright Technicolor prose, I do sometimes want a peek at the tomato herself. So if you're that way too, please, welcome, have a peek at ours. As a child, I can remember my father talking to other gardeners over fences. They swapped tips and worried about a dry spell or handed over extra cucumbers. There was a lot of head-shaking and hand-wringing and laughter too. They helped one another be better gardeners. A few of our neighbors garden. The couple up the hill seems always to have corn as high as an elephant's eye and lettuce to share. Last year, it felt a little better after the hailstorm to mourn our lost crops together. Thirty years they've been here but never been wiped out like that. My friend down the road waters my garden, and I water hers. And I learn a lot from walking around her beds, and from listening to her when she walks around mine. It makes me wonder what it must have been like when everybody up and down the road gardened, and harvest time defined even a school's schedule. I wish for a time when gardening was central to a community. But, in some ways, it must have been a lot like the gardening over the Internet fence. My online circle of gardening friends has urged me through this blighted summer. When I think back on it, I'm so grateful to all of you. June was awash in rain, and sometime that month someone on the Maine Locavores listserv passed along a warning that late blight had moved as far north as Massachusetts. I had already had a tussle last summer with a minor fungus, and I had resorted to Serenade as an organic way to fight it. Even with the constant rain, I had been wavering about spraying again this year. But after that warning, I went right out and bought what appeared to be the last bottle in southern Maine. I also bought worm poop. Yes, worm poop. I paid ten dollars for worm poop. Over at Daphne's site, I had read that she was alternating her organic fungicide with a spray of worm-poop tea (secret immune-boosting ingredient: aspirin). I yoo-hooed over the blog-post gate to my young gardening friend (who will be starting high school next week!) that she should probably go check out Daphne's advice too. July brought more rain and, even with the spray, what looked to be late-blight lesions appeared on the leaves of my tomato plants. In early August came news that dear Beegirl's tomatoes had been wiped out in Pennsylvania. She posted photos, and gardeners gathered at her site to commiserate and share links about late blight. I ached for her. By now, I knew I had it on the leaves. Should I pull the plants and bag them to curb the spread of spores? Or should I try to nurse them through the disease since late blight was already so widespread that my twenty-six plants weren't going to make it any worse? I found some amazing advice in this FAQ round-up from Cornell University. So I kept spraying and clipping damaged foliage. I went out twice a day and policed with my pruning shears. And I got lucky, really lucky: The sun came out. I clipped two stems where the lesions appeared, but the plants seemed to revive a bit as the temperatures soared and the skies stayed clear at last. Don't get me wrong: The plants are one-third the size they usually are at this time. They have barely set fruit. They are so puny that not one hornworm has been tempted to feast on them. Let me repeat that: Not one hornworm has deigned to take so much as a nibble off our sick little plants. (Of course, Daphne says the hornworms love her blighted plants, so what do I know about why the hornworms aren't here.) The Sungolds are producing about a pint a day from six plants; another season the harvest would be a quart or more per day. The heirloom slicers each have about one tomato with a chance of ripening. The Moskovich (pictured) has been hardest hit by the blight but has provided us two ripe tomatoes so far and another one is blushing. It's a powerhouse, considering. Our season is almost over. Frost warnings are up tonight a couple of counties north of here. Hurricane Danny threatens to bring flooding rains this weekend. With damp weather comes renewed vigor for late blight. I don't know how many more tomatoes we'll get. Certainly our freezer won't be filled with sauce cubes. But I consider it a gift of gardening over the Internet fence that tonight we ate a tomato-and-bread salad. We could taste the sunshine in that supper. After much rain, we feasted at last on this season's little bit of sunshine. As friends prepare for back-to-school, they often ask us: "When do you start up again?" Truth is, we never stopped. There's science in the river and math in that recipe for cherry-almond granola and history in the Quaker cemetery around the corner. Sure, at the supper table lately we're asking one another what we would like to do when the days shrink, when we're once again gathered around the fireplace. But mainly we're still out under the sky as much as possible. The sky -- and everything beyond it -- has been a consuming fascination for us this past year. Fern and Blossom became entranced by rockets. If there is one thing I am not equipped to teach, it’s rocket science. (Actually, rocket science is just at the tip-top of a very long list of things I’m not equipped to teach.) Fortunately, homeschooling is not about keeping our children at home and faking my way through my own blind spots; it’s about exploring together and finding wonderful teachers in the world around us. At our oh-so-cherished Saturday Chinese school, the girls have been taking a series of classes about inventions from China. Last fall, the resident Rocket Man had the students firing off soda pop-bottle rockets propelled by compressed air and water. Blossom’s got stuck forty feet up in a tree! Sometimes, it turns out, we don’t find the great teachers just in the world around us, but in orbit around the world itself. Fifteen summers ago, we built our first home in Maine. Our contractor would snort to hear me say that we built it, but Birch pounded nails and sanded floors and laid the hearth. We both scaled scaffolding and oiled the clapboards. My father came for six weeks, and he got up on a forty-foot ladder to paint the trim at the peak of the roof, and I had to go cry on the beach because I couldn't bear to think of him on nothing but a spindly-legged ladder so far up in the stratosphere. It was truly sweat (and tear) equity. The house sat on a hooked finger of a peninsula. There was a beaver-and-blueberry bog to one side, and the lake opened into its beautiful blue stretches on the other. As a housewarming gift, my dad took us down to the local canoe shop and bought us a second-hand canoe that was wide and steady-as-she-goes. It had to be built that way because it was to be our chief means of picking blueberries. Daddy would paddle, and I would stand and pick. We paddled and picked for hours (though we only measured time by whether we had enough berries for pancakes or muffins or a whole pie). He whistled. He told me stories. We laughed. We listened to the birds. Every August, Daddy would come for his visit. His favorite thing to do was get up early and go silently around all the coves in the canoe. Birch and I used the canoe year-round of course. We would paddle out to greet the water after the ice melted. On hot days, we went to a favorite island where the swimming was exquisite. We floated through the mirrored reflection of autumn leaves blazing. When Fern and Blossom came along, they dangled their fingers. They skinny-dipped off the sides. They practiced paddling the j-stroke Grandpa Hickory taught them. We took the girls out one unforgettable night to see Venus at its brightest. Then we sold the house on the lake. We needed more sunshine and land to garden and grow. Now the canoe just sat in an outbuilding on the four green acres; the river here was just too filled with waterfalls. Grandpa Hickory would come in August and take walks instead of paddles. Somehow he and I never found a way to replace our blueberry-picking and paddling and storytelling and bird-watching. 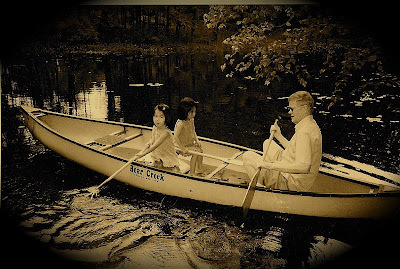 The canoe had been a contained world without distractions: My father took us where whim suggested, the girls played in the bottom of the boat, I scouted the next best bush. We felt a deep, peaceful synchronicity of purpose. Last August, Grandpa Hickory announced that this was to be his last visit. He was done with travel. We kept hoping he would change his mind, but he didn't. So it was terrible this year when it was suddenly the first Tuesday of the month, the day he had always arrived, only this time he didn't arrive. And in one of those terrible twists of fate: The canoe had vanished the day before. In the years since our move, it has given us pleasure to share the canoe with dear friends of ours who have a yearly vacation on a lake with many islands to explore. It always makes me so happy to think of the canoe out on the water with a family having fun. But those poor kind friends had to come home without the canoe this year. A storm swept it away in the night. They cried telling us. How awful for them. We hated it for them as much as for ourselves. I lay awake at night and tried to think of the lost canoe as something like the little boats that are part of Asian water festivals. People who live along the rivers set candles afloat in the boats and let them drift away. It's a way of letting go of unhappiness and of welcoming renewal. Still, my unhappiness clung. It has been a heavy summer in many ways. And losing the canoe felt like losing even the possibility of ever having another carefree summer where I floated with my father while he whistled and I picked blueberries. It felt final. But while I was mourning the loss of the canoe, our friends were alerting every authority in the state of Maine: sheriffs and rangers and wardens. And, finally, one of those calls got returned with good news. The canoe was found! And now the canoe is back home! Until we can get it back in the water, we take turns just sitting in it out there in the long grass. And I have to say that though many things about this summer are still all wrong, I can float free of my worries sometimes. I can imagine that there will come a day when Grandpa Hickory will decide to make his way here, and we will go out in the canoe, and he will whistle, and I will pick a pie's worth of blueberries. Hearts are sore here. August usually brings Grandpa Hickory for a good, long visit. It brings sun-ripe tomatoes. It brings long days that ease into nighttime while we're telling stories in the swing. But not this year. Instead, we have late blight, many worries, and worst, another lost chicken. Marmalade died. Blossom and Fern thought they had nursed her back into the pink after she looked a little pale on Sunday. But, alas, just as Birch slid our supper into the pizza oven Tuesday evening, Blossom cried for help from the chicken coop. She had found the little hen in her final moments. It's hard enough to be ten years old and lose your favorite chicken. But to watch her die? It's unspeakable. Supper burned. We spent the night crying. All the trouble has kept us away from all our friends' blogs. We apologize. We miss you. We'll be back soon. Right now, we're trying to get balance back in our lives. The girls blew the innards out of Marmalade's last two eggs, which fortunately were still in the fridge. They made a little shrine on their windowsill. And since she was the last of their cuddly chickens, they're nurturing a new love...the rooster. Oh, and there are brighter posts in the future, we promise. We may not have many tomatoes to sauce this year, but did you catch it up there when I mentioned that Birch slid supper into the pizza oven...? Yep! The pizza oven is roaring, and what's coming out of it is enough to perk us up even during this bleak August. Anyone who has rented a truck at a big-box home store knows the Zen koan: Do you shop first or rent the truck? Fortunately our local big-boxer will hold the truck for a half-hour while you shop, then start the rental clock after you've loaded. And with a fork-lift, a pallet with sixty-five concrete blocks loads fast. Along for the ride with my blocks were twenty bags of ready-mix concrete and a few ninety-pound bags of Portland cement. There were also five ten-foot lengths of rebar. To the casual observer, I had the makings of a fine underground nuclear fall-out shelter. But it was the stand for our pizza oven that I was aiming for. The blocks were stacked hard against one side of the bed, which made for a precarious load, but I took off anyway. I was anxious to get everything unloaded at home and return the truck while June, Fern and Blossom were at the beach. The truck drove fine out of the lot, but when I came to that first turn into traffic, I took it too sharp. Down went the concrete blocks. Funny how a ton of bricks—or blocks in this case -- falls just as hard as they say it does. The truck wagged dangerously. One concrete block clunked to the street, almost hitting someone's new Prius. I hit the flashers and scurried out to retrieve my block. The rest of the blocks had stayed put in the truck bed, blocked by the bags of concrete stacked next to them. Fortunately, I had bought a few extras, but I hadn't intended to leave them on the street like a breadcrumb trail. After I established a level back corner with a trowel of mortar, I set the first block in place. I was going five courses across and four up, dry stacking the blocks. At the front of the stand, I used half-blocks to create a three-by-three foot opening for wood storage. A heavy piece of iron creased with a right angle would support the fourth course of blocks over the opening. When the blocks were stacked and leveled, I cut up my rebar into equal lengths and mixed my of concrete. I filled every other core of the hollow block with concrete and rebar. A few days later when it was dry, I began the concrete support table for the oven. I cut two pieces of one-half inch thick plywood to fit inside the blocks that formed the stand. I built props from two-by-fours and fastened those to support the plywood. And that plywood needed help because I was about to load several hundred pounds of cement on it. I built an eight-inch tall frame around the top of the stand and filled it with five inches of concrete mix and rebar. When that was dry, a three-inch insulating layer made up of vermiculite mixed with Portland cement was smoothed over the concrete table. This would help the oven maintain its heat. With the oven platform completed, I was ready to build the oven dome. But early below-freezing nights and a fall snowstorm managed to interrupt my carefully composed schedule. There would be no wood-fired pizza to warm us that winter. Coming up next: Spring brings firebricks. 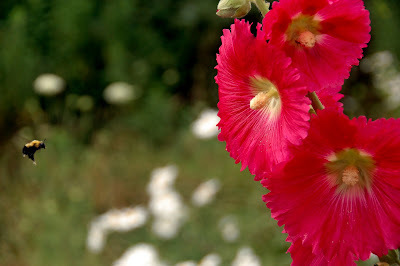 This wet summer, the leaves have rusted right off my hollyhocks. I've been trying to let the poor ragged plants stand for as long as possible so the seeds can ripen, but now that the Japanese beetles are buzzing and chewing, it's time for them to come down. They were planted in the back-porch garden. We saw a lot of rain and fog through the stand. And lots of bees at work. And I finally figured out what to do about the Japanese beetles eating holes in the flowers. Send the kids to Photoshop camp! See up above how that flower got chewed to pieces? Now look again below: Fern fixed that flower right up, didn't she?